Cobra lily or Jack in the Pulpit from Japan with exotic striped flowers in mid-spring but the bold and glossy foliage steals the show. Forming large patches in rich, WELL DRAINED soil with regular summer irrigation. Shade- protect the amazing leaves from blasting sun. They will stand prominently up to 2′ tall- triple lobed, glossy and good looking. One of the more reliable of the genus. Mix with other bold shade perennials. Mulch with compost annually. Disappears entirely in winter. A Xera favorite perennial. We sowed the seed and I’ll be damned if hundreds came up. 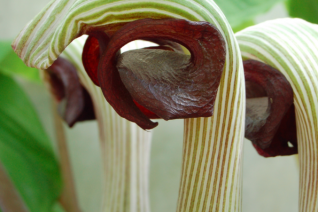 This remarkable form of one of our favorite Jack in the Pulpits. 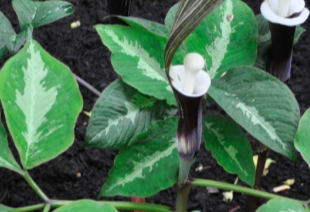 Deep brown hoods host an interior spathe of pure white It looks like a little ghost rising up. Adorable. The large trifoliate leaves on this form are marked on the interior with a zone of silver. All together a fantastic look for a woodland perennial that requires deep, rich, well drained soil and ample summer moisture. Shade. Emerges late in spring- be patient and the way the bulb grows underground it means that it can wander a bit each year. Multiples when happy to form clumps. Completely winter deciduous. To 20″ tall.